Easy-to-read charts, diagrams, and illustrations provides practical guidance on topics the successful lawyer's assistant must address every day. A bibliography, several glossaries and index are also included. 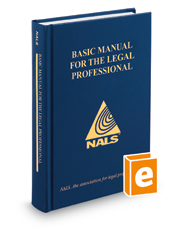 It is the required text for the NALS Legal Training Course and reference for the PLS and Professional Paralegal exams. A Student Study Guide (419631) and an Instructor's Manual (419619) are not available for general sale, but are available to course Instructors.